I know, it’s New Years Day, the start of a brand new decade. It’s about fresh starts, and optimism. That is, unless you’re a Wizards fan. And then you wonder how this happens. 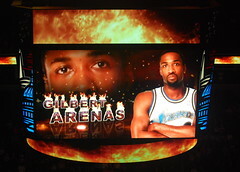 Gilbert Arenas was reportedly in a dispute with drawn firearms with teammate Javaris Crittenton in the Wizards Lockerroom. On Christmas Eve. Over a Gambling Debt. Fellas, be glad that Abe Pollin didn’t live to see this. Because this would’ve killed him from sheer embarrassment. In addition, federal authorities and MPD are investigating the incident. I’m not sure why the feds are involved, as this would likely be an MPD investigation, but if the reports are corroborated, Arenas and Crittenton could face felony firearms charges. 2009 really had some great sports drama stories: Tiger, Texas Tech/Mike Leach, and now this. As the Snowpocalyspe snowball fight taught us, always bring a gun to the Wizards locker room. I think John Woo needs to direct the movie version of this.